Our school is on a six-day rotating schedule. Every day--1, 2, 3, 4, 5, and 6--is a different schedule. On Day 4, I have been doing a "Day 4 Kahoot" at lunchtime. It only takes about 15 minutes to play a game of 25 questions, and I offer prizes for the top three winners. The students love it, and I have a lot of regular players who come every Day 4 to play. My email totally blew up in the past week with requests to share my Kahoots! Instead of sharing every Kahoot with every email, I made them all "visible to everyone" and provided the direct links on the Kahoot list above. I'm so happy so many of you love Kahoot as much as I do! Pick a regular day to do the Kahoot. This will help students remember to come and will help increase student participation. Brainstorm some themes of your Kahoots. Keep a list of possible future Kahoots, and give students a chance to propose themes. Write your Kahoots throughout the week. I keep Kahoot open in a tab and write questions as I think of them throughout the day. I aim for 25 questions per Kahoot. 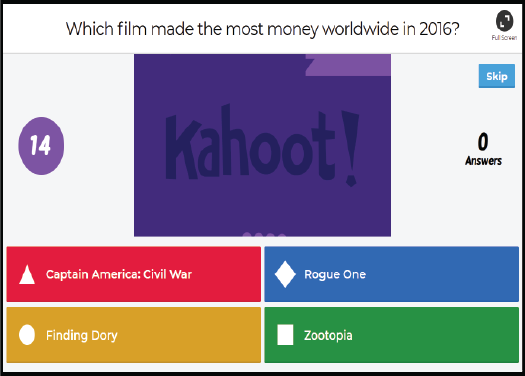 You can also search Kahoots other teachers have shared for more ideas for questions. 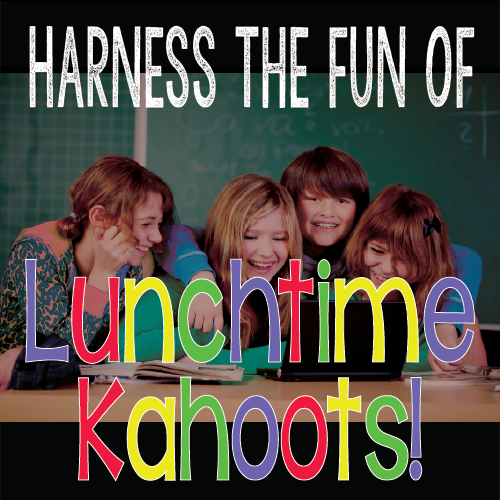 Save time by letting your students write Kahoots! They can also decide on and bring the prizes. I would suggest previewing the student-written Kahoots beforehand to make sure they make sense and that the questions aren't too ambiguous. That happens more than you would think, and the students get mad when many questions are worded in a way that they constantly get the answers wrong. Advertise. I run a daily scrolling PowerPoint with the library schedule and announcements. The next Kahoot date and theme are part of the announcements. Buy prizes. I try to make my prizes coordinate with the theme of the Kahoot. For example, for a Kahoot on "Dogs in TV/Film," the prize was cute ankle socks with dogs on them. See below for a list of the Kahoots I've done so far and the prizes I've given. 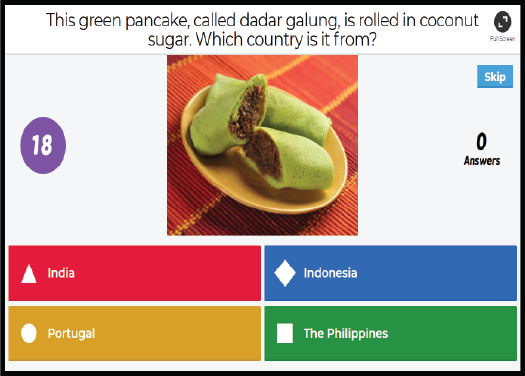 Set up your Kahoot so that the questions advance automatically and that answer choices are in random order. Both of these options are part of the settings for the game, and they can be changed any time you want to play a new game. Be sure to check them every time you start a new game. On the day of the Kahoot, I start prepping the library about 30 minutes before the Kahoot starts. I set up the Kahoot to show on the TV in our library so that it advertises the Kahoot and is ready to go promptly at our 1:30 start time. I encourage students to bring their own devices and use the Kahoot app, but I also set up library computers and ipads with the Kahoot app already open and ready to go for those who do not have their own devices. We only have 15 minutes, so we don't have time to sit and wait for the slow school computers to login. Everything is ready to go so that we can start and finish on-time. Allow students to use their own devices. This will enable more people to play and will mean less clean-up at the end. 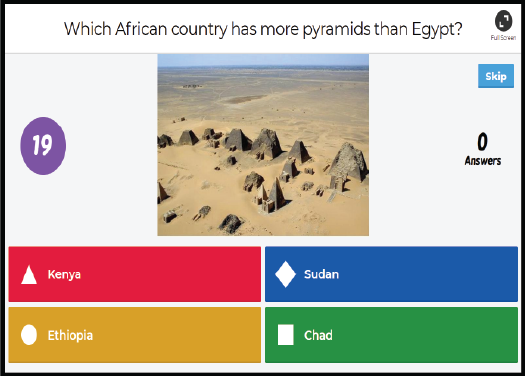 The Kahoot app is free and works well. If you have set up your Kahoot questions to advance automatically, a 25-question game will take about 15 minutes to play. Have prizes ready for the top three scorers. Kahoot will show the top three scores at the end of the game, as well as between each question. You're done! Don't forget to ask students to logoff school computers, plug in chargers, and help you tidy up the library. If you have your own kids, you can hook up a computer to your TV and play Kahoot at home. My family makes up Kahoots for each other, and we play every weekend! How do you use Kahoot in your library? Do your students beg you to do Kahoots as much as mine do? Love this idea, thank you! Sending you an email now, would love to have them! Do you allow students to look up answers in books as they play? I have a similar game on-going in my library: Weekly Library Trivia. A student thinks of a question to ask that can be found by using our online library catalog. Students put their answers on a slip of paper and their name. Out of the correct answers I draw three for random prizes (posters, book marks, pencils/erasers, sticker sheets, etc.). Now I'll have to look up Kahoot, thanks!